Hotelcloud scheduled to release Version 2 of its platform for hotel guests at HITEC, June 24th. New York, NY - Hotelcloud will officially be launching Version 2 of its innovative platform at HITEC, the Hospitality Industry Technology Exposition & Conference, taking place in Minneapolis, from June 24th to 27th. The event is the perfect opportunity to introduce a brand new design and improved guest-driven features to key global leaders of the hospitality industry. Hotelcloud’s mission has always been to seamlessly connect guests to the world that surrounds them, from hotel services to local activities and brands. Interactivity has been a key component of Hotelcloud’s platform since day one and is the reason for the company’s success. The new version of Hotelcloud will go even further by adding a powerful discovery and ordering platform for local vendors. Starting in July 2013, any Hotelcloud guest will have the ability to order in a single-click and pay directly online for any service of Hotelcloud’s ecosystem of local partners, such as a tours, transportation, ticketing and all relevant services while traveling. This largely benefits businesses who enroll, providing them with increased visibility and an enlarged customer base. Hotels also greatly benefit from this ecosystem: they receive commissions on each purchases made by their guests while enhancing their guests’ stays. Hotelcloud Version 2 is available in up-to 40 Languages, enabling personalization and improved service for international travelers. Among other new features, the platform will allow guests to pre-order services, before arriving at the hotel. At a time where technology is an increasing part of an individual’s day-to-day life, Hotelcloud aims to revamp the guest travel experience through the use of innovative technologies. The guest’s full travel itinerary will finally be centered around their hotel experience - from the moment of booking. 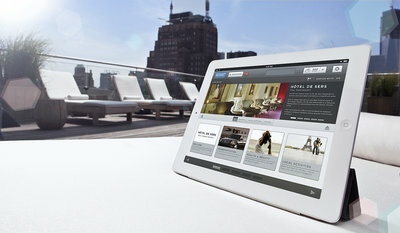 Hotelcloud is a NYC based startup, founded in 2011. Hotelcloud has developed a one-of-a-kind online platform empowering hotels guests with real-time ordering of any internal services alongside those of approved local activity partners. Hotelcloud helps hoteliers increase sales and generate new revenues through pre-negotiated partnerships with local attractions and businesses. The responsive HTML5 platform is accessible from any web device: smartphone, tablet, or computer, including a guest’s personal devices. Being a SaaS, Hotelcloud does not need any hardware or software to run nor to install: the platform works on any operating system. Today Hotelcloud is distributed in 10 countries and continues to expand into new markets. For more information, please visit http://thehotelcloud.com. Visit us at HITEC, booth 1248.